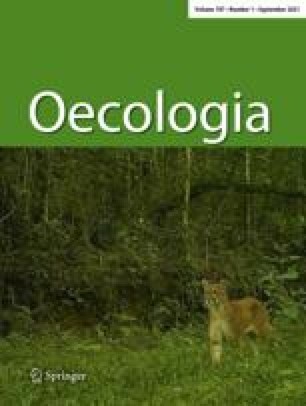 To test the hypothesis that natural enemy populations differ in their behavioral responses to plants or to plant allelochemicals, we compared two populations of the gregarious larval endoparasitoid, Cotesia congregata (Say) (Hymenoptera: Braconidae) that differed in their historical and present exposure to tobacco. The major hosts for both populations were Manduca sexta L. and M. quinquemaculata (Haworth) (Lepidoptera: Sphingidae), but these hosts were typically encountered on tobacco by parasitoids in one population (Upper Marlboro) and on tomato by parasitoids in another population (Wye). Early in the season, Wye parasitoids preferred to oviposit in M. sexta on tomato rather than on tobacco and Upper Marlboro parasitoids showed no preference; neither population showed any preference later in the season. Neither of the strains originating from the two populations showed a landing preference for tobacco or tomato in flight chamber trials, but Upper Marlboro parasitoids searched longer on tobacco than on tomato, and Wye parasitoids searched longer on tomato. When nicotine solutions were applied to tobacco leaf, searching responses of Upper Marlboro parasitoids were enhanced by 0.001–1.0% nicotine, and searching responses of Wye parasitoids were decreased by 0.01–1.0% nicotine. We speculate that population differences in searching responses to tobacco and nicotine may explain the differential parasitism responses found early in the season.